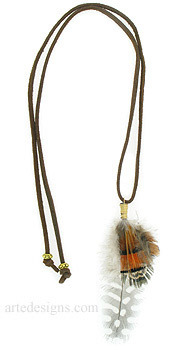 Handmade Feather Necklaces - The 2 beads on the suede cords can be worn in the front or the back of the necklace. Each feather is one-of-a-kind, so all feathers will vary slightly in color, size, and shape. The feather lengths that are provided are close approximate ranges. Feathers may vary a little shorter or longer than the given lengths. The two side beads will always match, but I often use various bead styles to keep the feather necklaces unique. If you have any questions, please contact me before you make a purchase. See matching Feather Earrings. These natural feathers have just a hint of orange. White spots may vary in size and some feathers will have a little green. Approximately 2.5 - 3.5 inches long. Feather necklaces are available with tarnish resistant silver or gold plated wire. Choose a 20 inch brown or black suede cord that ties in the back or an adjustable 16-18 inch sterling silver chain. Feather jewelry with Peacock feathers and more. Handmade feather necklaces by Arte Designs. These feather necklaces are just what you need to get in touch with nature. All feathers have been cleaned and disinfected and individually wrapped with tarnish resistant silver or gold plated wire. Go ahead and express your wild side! Be unique and make a statement with feather jewelry. No birds are harmed.